Press Release (ePRNews.com) - CARLSBAD, Calif. - Dec 18, 2018 - NOTE: This June SPS profile was originally published in print in June 2018 and online in May 2018. Rich Lendino is the head painter at Martin’s Collision Center in Sanford, FL. The company also owns and operates its sister location, Sanford Body & Paint. In many ways, Lendino was born to be a painter and knew early on it was the right path for him to take. With USI North America’s EPS System, per vehicle, we’re saving roughly 25 minutes every cycle, which is definitely significant. Essentially, you enter the job’s parameters in the system and it tells you the best way to paint the car. When Lendino started in the industry 23 years ago, there were a lot of veteran painters out there, but now many of them have retired and there aren’t enough new people to fill the void, he said. Lendino played an integral role in finding his company’s new booth when their former booth was ready to retire. 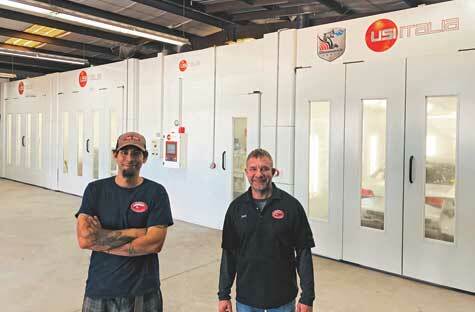 “When I first got here, we had a few older booths, but the owner, Dave, told me that we were going to be getting new booths within two years,” he said. “Sure enough, about two years later, he asked me to start calling booth companies and talk to all of the manufacturers. At a shop that fixes more than 150 vehicles every month, Lendino needed more than just one booth. He needed a system, and USI helped him fulfill all of his specific needs, Lendino said. USI North America’s EPS System is saving Lendino a lot of time, which is quite important to any high-production shop, he said. “Per vehicle, we’re saving roughly 25 minutes every cycle, which is definitely significant,” he said. “Essentially, you enter the job’s parameters in the system and it tells you the best way to paint the car. In Florida, one of the most humid states in the country, a booth’s airflow is vital, especially for a shop that sprays a waterborne product. Backed by strong support and customer service from USI North America, Lendino knows that when he encounters any issues, he will get prompt and precise answers every time.